In this 3 week painting workshop, beginner students will learn how to sketch and paint a winter landscape scene in either oils or acrylic with an emphasis on creating light and shadow with an impressionistic approach. Photos will be provided as a reference or students can bring their own. 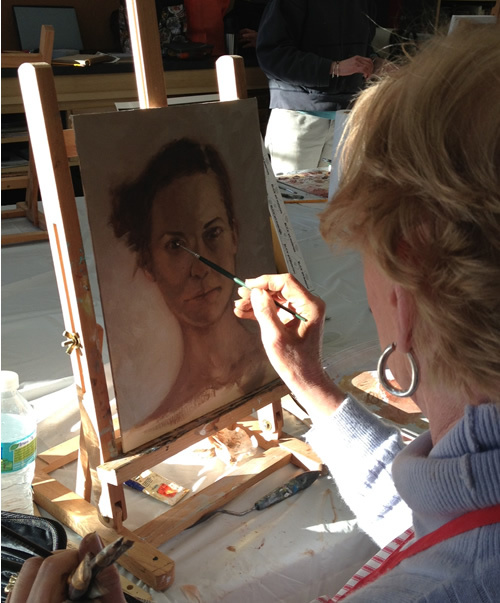 The instructor will lead the class with demonstrations, from initial sketch to finished painting. Instruction will be given in composition, sketching, value, color mixing, brushwork and use of materials. This class is suitable for the beginner student who wants to further their skills. Oils or acrylics are suitable for the class but the instructor will be demonstrating in oils. (Jackson Art can provide you with use of art materials including for a fee of $75 for the three sessions: includes use of oil paints, brushes, palette, rags, gamasol, canvas, & drawing supplies) Class size is limited to allow for individual attention. This class is open to adults & high school students. 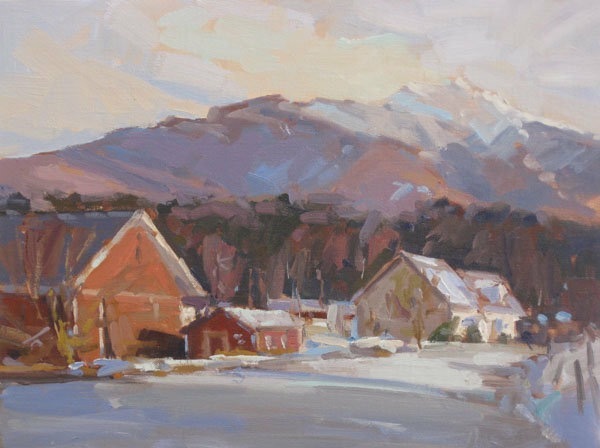 Learn to paint the beauty of a winter landscape in the comfort of a warm studio in the heart of the White Mountains! Learn the general guidelines for painting snow scenes that include choosing the right palette for the task, understanding how to capture the high key effect of bright sunlight and how reflected light gets bounced around a snow covered landscape. David will begin each day with a one hour demonstration and discussion of his working methods in an orderly step by step process of simplifying shapes, color and value to achieve a successful painting infused with color and light. Students will work from their own photos or choose a photo from our vast library of 8×10 winter landscape references. David will offer individual help to each student towards a successful painting each day. Class size is limited to 10. (NEW!) 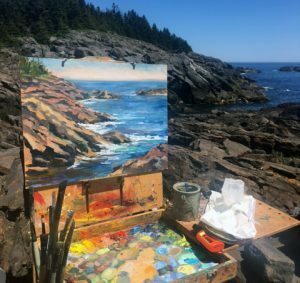 April 2019: Key Elements of Plein Air Painting with nationally recognized artist, George Van Hook (oil, pastel, watercolor, acrylic). 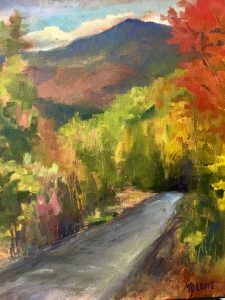 This two day Fall plein air workshop will take place in the beauty of the White Mountains of NHand will be led by award winning artist, Cynthia Rosen.The richness of the landscape will match that of our color and image exploration.Each day will begin with a painting demo focusing on intent,composition, use of color and technique. 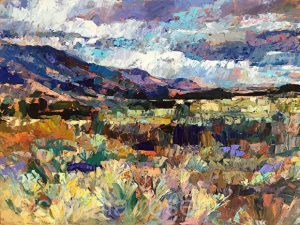 Cynthia will demonstrate her unique palette knife technique using a limited color palette. The class will be kept small to allow for individual attention. We will meet at Jackson Art and then travel to painting locations in Jackson, NH. Participants are responsible for bringing their own painting supplies. Oils or acrylics are suitable for this workshop but the instructor will be demonstrating in oils. 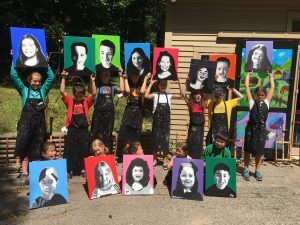 REGISTRATION IS OPEN FOR 2019 ART CAMPS! This camp is for the kid who loves art and wants to create for FOUR FULL DAYS! Students will work on numerous projects each day and be exposed to a variety of materials and techniques. Space is limited and only high quality art materials are used. Some projects include: Georgia O’Keefe acrylic flower paintings, mixed media self portraits, washer wind chimes, clay leaf bowls, batik nature hangings, Jackson Pollock splatter art, rock creatures, insect studies, zentagles, colorful collage, mosaic stepping stones, watercolor technique, outdoor nature drawing, games. art history & more! Please pack snack, lunch & white t-shirt. SPACE IS LIMITED TO ALLOW FOR PERSONAL ATTENTION! 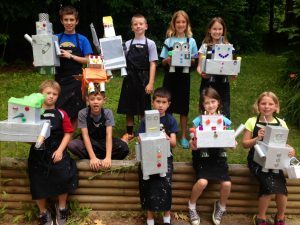 This camp is for the kid who loves art and wants to create for five full days! Students will work on numerous projects each day and be exposed to a variety of materials and techniques. Space is limited and only high quality art materials are used. Some projects include: Mt Washington acrylic paintings, rainbow weavings, clay birds, funky self portraits, colorful wire sculpture, modge podge watercolor collage, mosaic stepping stones, Jackson Pollock splatter painting, Japanese brushstroke painting, rock pets, mini mosaic fairy/gnome houses, Miro watercolors, outdoor nature drawing, games, art history & more! . Please pack a snack, lunch & white t-shirt. At the end of the week the kids will put on their own art show. SPACE IS LIMITED TO ALLOW FOR PERSONAL ATTENTION! Students will leave with more artwork in one week than they do an entire year at school. This evening program for teens will run for four consecutive nights and will expose students to a variety of art forms including drawing, Japanese brushstroke painting, mixed media and mosaics. Day one will focus on drawing. Each student will work at their own level on a still life composition. Line, shadow, form and composition will be covered. Day two will focus on Japanese brush stroke painting. Students will learn how to do basic sumi-e brushstrokes working with black ink on rice paper. They will complete a finished bamboo painting along learn about sumi-e materials. Day three we will focus on mixed media. Students will create a unique piece of art using recycled materials. The last day will focus on mosaics. Students will create their own mosaic project using broken tile, glass beads, stones, shells and other materials. All the supplies are included, but students should bring a notebook or sketchbook. No prior art experience is required and all levels are welcome. Class will be limited to 8 students to allow for individual attention. Friday, Sept. 21.-Arrive to Monhegan Island on join Melanie for a short hike followed by a wine and cheese welcome at the Trailing Yew. We will have a Lobster dinner (additional food choices for those who don’t eat lobster) and sunset painting demo. Saturday, Sept 22, we will enjoy a hearty breakfast at the Trailing Yew followed by a group yoga class and a morning painting session. In the afternoon we will take a walk to Lobster Cove and enjoy a snack and optional beer tasting at Monhegan Brewing. Evening painting session optional. 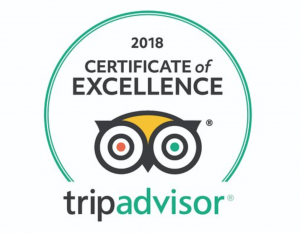 Sunday, Sept 23, we will enjoy another hearty breakfast at the Trailing Yew following by a short hike around the island. We will visit the Monhegan museum and Lupine art gallery and then have a painting session in town. Particapants can take an afternoon ferry or spend and extra night on the island. Regardless of your level of experience, the goal of this workshop will be to provide you with a thorough introduction to traditional 19th Century landscape painting technique using a layered approach. 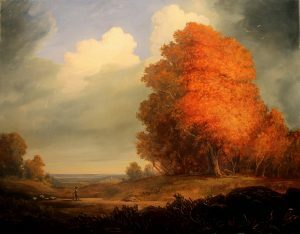 In this class we will focus on how to capture the beauty of autumn color, in a convincing realist manner. Students will discover a deeper understanding of how the old masters approached painting this magical time of year. And what incredibly vibrant colors can come from transparent glazed oil color! We will also discover how they composed the complexity of nature, and how they used a layered approach to greater capture subtleties of space, and form in the landscape. All levels gladly welcomed. Supply list sent to registered students. Space is limited to a small group to allow for personal attention. Learn the ancient art of mosaics. In this full day class, you will create a beautiful 6″x6″ mosaic art panel of a landscape. This is a structured, hands-on class! Instruction will cover in-depth design techniques, adamant, opus, color, materials, history of mosaics, adhesives, mosaic bases, tools, and cutting techniques. This class is great for beginners and experienced students who would like a more in depth exploration of this fine art! Class size will be small to allow for individual attention. A materials fee of $35 will be paid to instructor at the class to cover all the mosaic supplies needed. Please pack a lunch or one can be delivered. 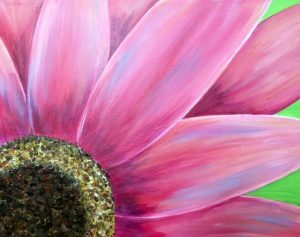 In this one day workshop, Joelle will guide you through the process of creating a close up flower painting using acrylics. Students will first sketch their flowers in proper proportion to create a dynamic composition and do a small color study. Attention will be giving to choosing a color palette, blending color, and how to build up a painting in layers starting with darks to lights. The small class size will allow students to receive one on one attention. The instructor will provide close up flower images to choose from. This class is suitable for the beginner student or to those who have painted and want to move to the next level. A supply list will be emailed upon registration. Students will be required to bring their own acrylic painting supplies. A supply list will be emailed to registered students. In this weekend workshop, participants will learn new and exciting ways to create interesting effects in watercolor painting. Michael will demonstrate unique ways to alter the wash and alternative tools to use that will help you paint beyond the restriction of the brush. By experimenting with methods before, during and after the wash is executed, artists will achieve spontaneity in their painting. The instructor will also demonstrate how to create an “Active Wash” that is used to manipulate “Lost and Found Edges” in a watercolor painting. Michael will encourage artists to dive in, set aside their fears and begin to paint without a lot of pre-planning. Students will learn new techniques that will give them the freedom to let go and allow the medium to do what it does best without having to control every outcome. Be sure to bring a notebook! 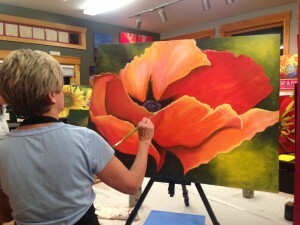 There will be a plethora of step-by-step demonstrations that bring the fun back into painting. This class is designed for the beginner and experienced artist alike. Participants should bring photos or drawings to apply these techniques to make experimental watercolors from. Students are responsible for their own supplies and a supply list will be sent to registered students. Michael E. Vermette double majored in Painting and Printmaking at the Maine College of Art, receiving his B.F.A Painting degree in 1980. He received his Certification in K-12 Art Education in 1986 through the University of Maine at Orono. 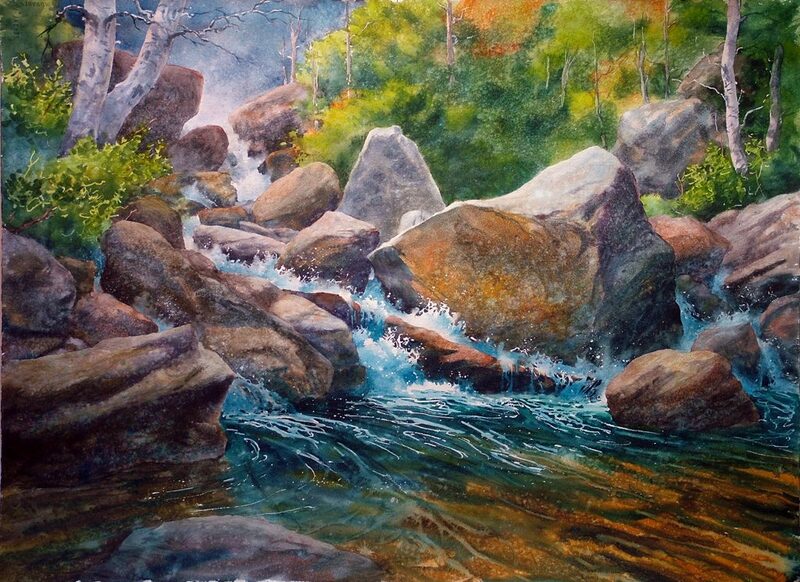 A full-time artist and part-time teacher, Michael has been painting in oil and watercolor, for over forty five years and has won numerous awards for his work, including the Laura Coleman, Beverly and Marilyn Sabin Awards at the 12th,13th Biennial North American Open Shows and last year’s New England Watercolor Signature Member show 2017. Currently, Michael’s work was featured in the Preview: Massachusetts by – B Amore in an article called: The New England Watercolor Society, 2018 Signature Member show. In this 3 week painting workshop, beginner students will learn how to paint a Winter scene in either oils or acrylics using both the brush and palette knife. 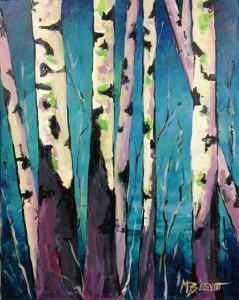 Instruction will be given in using the palette knife to create texture and depth in a painting. We will also discuss composition, sketching, value, color mixing, brushwork and use of materials. Photos will be provided as a reference or students can bring their own. The instructor will lead the class with demonstrations, from initial sketch to finished painting. Students will gain an understanding of how to depth and light in their painting. This class is suitable for the beginner student who wants to further their skills or the intermediate student who wants to get to the next level. A supply list will be emailed to registered students. Oils or acrylics are suitable for the class but the instructor will be demonstrating in oils. (Jackson Art can provide students with use of art materials including for a fee of $85 for the three nights: includes use of oil paints, brushes, palette, rags, gamasol, canvas, & drawing supplies) Also open to high school students. Learn the ancient art of mosaics. In this 3-week session you will create a beautiful 10×10 mosaic art panel. This is a structured, hands-on class in which you will design your own art panel. Instruction will cover in-depth design techniques, adamant, opus, color, materials, history of mosaics, adhesives, mosaic bases, tools, and cutting techniques. This class is great for beginners and more experienced students who would like a more in depth exploration of this fine art! A materials fee of $55 will be paid to instructor at the first class to cover all the supplies needed. Non-toxic watercolor monoprinting is a dynamic art form combining the colorful palette and radiant flow of watercolors with an unusual diversity of beautiful and compelling techniques unique to this process. 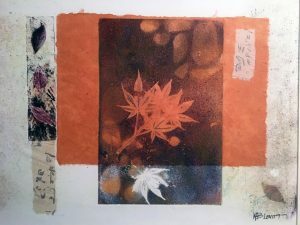 In this class we will use the chin-collé process incorporating Japanese papers with the printmaking process. Chine-collé is a special technique in printmaking in which the image is transferred to a surface that is bonded to a heavier support in the printing process.This allows you to print on the delicate surface of Jpanaese papers which pulls finer detail off the plate or also allows you to provide a colored background color behind the image. Students will also learn proper use of an etching press, the correct numbering and signing of your prints, plus different approaches to the medium with emphasis on double plate printing of foliage with chin-collé. Watercolor washes on the plate’s impermeable surface allows for a floating of color in a way no other medium can. You will also be taught how to do watercolor monotypes at home without a press. This exciting process loosens artistic tightness, inspires confidence and expands creativity. You need not have previous experience in either watercolors or printmaking to achieve beautiful results. A materials fee is included in the class cost and includes a set of watercolors specific to this process, 8 sheets of printmaking paper, two printing plates, use of class materials and Japanese papers. (limit of 6 people) Deadline for sign up, Feb 3. Silver Metal clay is made from fine silver powder with a binder and water. When fired in a kiln to just below the melting point the binder burns out and all the particles of silver fuse together. Only pure silver remains. The focus of this class will be to make 2 pendants in silver metal clay and learn how to bezel set a stone. Because Metal clay is a soft material before it is fired it is ideal for surface treatment. We will be using interesting textures and designs to create one of a kind jewelry and incorporate a stone. A materials fee of $75 will be payable to the instructor at the class. The second class will be finishing and assembling. In this 4 week after school class, students will spend time doing something fun & creative while also making unique gifts for their loved ones! Each week we will create one gift and it will come home all wrapped up in hand made wrapping paper. Projects include: Gingerbread house paintings, painted ornaments, mosaic tray, decoupage vases and personalized holiday cards. Why buy gifts when you can make them yourself? If students miss a class, supplies from that class will be sent home for them to finish on their own! Thursdays, Oct 26-Nov 16, 3:45-5:15pm, $105 includes all supplies, Ages 7-13Some Art Scholarships are available for those in need. Deadline for sign up August 16! This three day camp is for the kid who loves fairies & gnomes and wants to create a unique piece of art. Each student will make their own unique fairy/gnome house and garden using a variety of natural materials. The house will be done in a mosaic process from stones and ceramics. Windows and doors will be made out of clay and roofs created with shells and stones. The house will be surrounded by moss and other grasses. Students will also create unique miniature furniture and accessories out of natural materials. They can create walkways, stone walls, ladders, swings and mini gardens. They will also make a gnome or fairy to live in this magical garden! Each one will be unique. The house & garden will be the main project but we will also be doing other fun projects with a fairy/gnome theme-three days of fun! All materials included but kids are welcome to bring any special stones, shells, or other small hard bits. 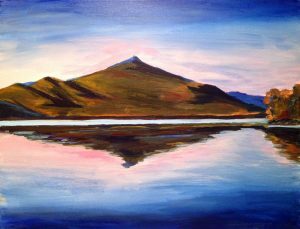 In this two day outdoor painting workshop, students will enjoy the process of setting up an easel outdoors and painting the beautiful White Mtn. landscape “en plein air.” Through demonstration and individual attention in oils, students will learn how to distill the important information from their observation and translate it onto the canvas. Melanie will address the importance of sketching, how to create depth in a painting, composition, color mixing formulas, light effects, and other tips for painting outdoors. All this will be taught in an understandable step by step process which will lead students to improve their ability to see the landscape and create a finished painting in a short time. This class is suitable for the total beginner or the intermediate student who wants to learn how to paint outdoors. Students will complete at least one painting a day. No need to invest in expensive equipment! We will provided all the supplies you need to paint for the day. (ie-use of plein air easel, paints, brushes, canvas, palette, turpentine, etc. (if weather is not suitable for outdoor painting, we will paint from photographs in the studio) This class is limited to 6 students to allow for lots of individual attention. We will meet at Jackson Art Studio and then travel to location. All students will need to bring a small sketchbook. Locations TBD. In this 2 day weekend workshop, students will explore how Matisse simplified his sketching and painting to create dyamic artwork. We will be drawing from a still life which we will simplify and transfer to a canvas in a similar style as Matisse. There will be alot of emphasis on the line and composition. We will also spend time working on textile patterns due to the influence of textiles as backdrops in Matisse’s work. Some drawing ability is helpful. Please pack a lunch or pick one up during the lunch break. Students are required to bring their own acrylic painting supplies. In this weekend workshop, students will learn traditional portrait painting techniques in oils utilizing a classicist palette. Without modernist colors the classicist painters of the Renaissance relied on tone over hue and chiaroscuro technique to create the illusion of three-dimensional form. We will work initially in value to create a grisaille composition of a traditional three-quarter self-portrait view, and then expand our limited palette utilizing traditional hues to create a finished self-portrait painting. Classicist portrait examples such as Da Vinci’s “Mona Lisa,” Vermeer’s “Girl With A Pearl Earring” or Rembrandt’s self-portraits will be discussed. Participants will complete a self-portrait painting in this workshop. Not recommended for beginners – participants should possess at least modest drawing abilities and some experience with painting. Friday night will be a painting demo and class will continue all day Saturday and Sunday. Students can pack lunch or can pick one up on the lunch break. Students are required to bring their own oil painting supplies. Registration OPEN! 2017 KIDS SUMMER ART PROGRAMS! This evening program for teens will run for five nights in a row and will expose students to a variety of art forms including drawing, painting, printmaking, mixed media and mosaics. Day one will focus on still life drawing. Students can work in pencil, charcoal or pen and ink. Lessons in materials, composition, and line quality will be covered. Day two will focus on acrylic painting. 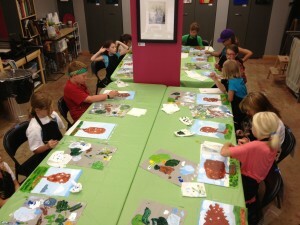 Each student will work on their own unique birch tree painting. Color mixing, composition, and use of materials will be covered. Day three will focus on printmaking. Students will learn how to use the printing press and the learn the process of creating a watercolor monotype. Day four we will focus on mixed media. Students will create a unique piece of art using recycled materials and metallic paint. The last day will focus on mosaics. Students will create their own mosaic project using broken tile, glass beads, stones, shells and other materials. All the supplies are included, but students should bring a notebook or sketchbook. No prior art experience is required and all levels are welcome. Class will be limited to 10 students to allow for individual attention. A limited amount of scholarships are available for those in need. This camp is for the kid who loves art and wants to create for 5 days! (full day and half day options available) Students will work on numerous projects each day and be exposed to a variety of materials and techniques. Space is limited and only high quality art materials are used. Some projects include: Van Gogh Starry Night Paintings, Recycled Robots, Sea Life Wire Sculptures, Mosaic Bird Houses, Japanese Brushstroke Painting, Jackson Pollock Splatter Painted T-shirts, Mixed Media Metallic Art, Zentangle Doodle Art, Funky Self Portraits, Monster Rock Pets, Outdoor Nature Drawing, Games. Art History & More! Please pack snack, lunch & white t-shirt. At the end of the camp, the kids will put on their own art show. (full day students only) SPACE LIMITED TO ALLOW FOR PERSONAL ATTENTION! Students will be exposed to many art mediums and projects and will leave with more artwork in one week than they do an entire year at school! Space is limited and this camp fills up quick. This camp is for the kid who loves art and wants to create for four full days! Students will work on numerous projects each day and be exposed to a variety of materials and techniques. Space is limited and only high quality art materials are used. Some projects include: Monet Bridge Paintings, Foliage Monoprints, Logo Design, Paper Mache Puppets, Mixed Media Metallic Art, Birch tree watercolors, glass painted fishbowls, Jackson Pollock Splatter Painted T-shirts, Outdoor Nature Drawing, Games. Art History & More! Please pack snack, lunch & white t-shirt. SPACE LIMITED TO ALLOW FOR PERSONAL ATTENTION! Students will be exposed to many art mediums and projects and will leave with more artwork in one week than they do an entire year at school! Space is limited and this camp fills up quick. This exciting three day workshop offers an introduction to process of Japanese woodblock printing. The Japanese developed this tradition using water as a medium, brushes to apply colors to the blocks, and a hand-held baren instead of a press to transfer colors from the carved blocks to the papers. This workshop is organized to offer a comprehensive introduction to the wonderful range of tools, technique, and materials involved in this process. Everyone completes a multi-color print and engages with aspects of design, carving, and printing. There is an emphasis ottn sharing tricks and techniques that may be adapted to other art-making (watercolor painting, western style printmaking). All experience levels are welcome. A $75 supply fee will be payable to the instructor at the first class and will include all the tools and materials needed for this workshop. March 30 – April 2 (3 day workshop) $355 Times will vary slightly each day. 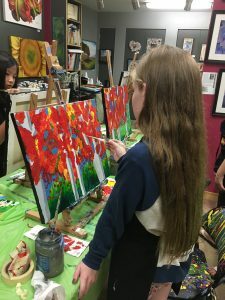 In this three week after school class, Joelle will guide students through the process of creating a large 16×20” flower painting using acrylics. Students will learn to sketch their flowers in proper proportion to create a dynamic composition. Instruction will be given in color mixing, blending paint and how to build up a painting in layers from light to dark. The small class size will allow students to receive one on one attention. Students from Jackson & Bartlett schools can take the bus right to the studio but need to arrange with school in advance. This class is open to all levels. Please pack a drink & a snack. We have smocks, but please wear clothes you wouldn’t mind getting paint on. 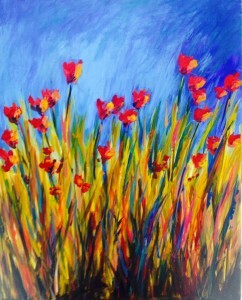 Tuesdays, March 7, 14, & 21 3:45-5:15 pm $105 (all painting supplies included) Ages 7-13 yrs. Back by popular demand!! In this weekend workshop, Joelle will guide you through the process of creating a very large scale flower painting using acrylics. Students will first sketch their flowers in proper proportion to create a dynamic composition. Attention will be giving to choosing a color palette, blending color, and how to build up a painting in layers starting with darks to lights. The small class size will allow students to receive one on one attention. Participants can bring their own flower photo or choose one from the instructor. This class is suitable for the beginner student or to those who have painted and want to move to the next level. A supply list will be emailed upon registration. Students will be required to bring their own acrylic painting supplies. A supply list will be emailed to registered students. Have you ever wanted to be more successful in mixing colors? 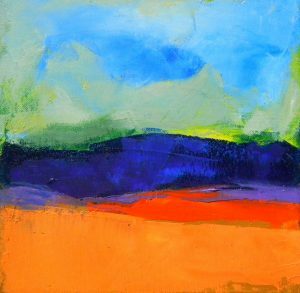 In this one day workshop, Melanie will lead you through a series of exercises in color mixing and your knowledge of color will grow dramatically in one day. We will discuss color balance, intensity, warm & cool, and complementary colors to help you create more successful paintings. Melanie will share some of her secret color combinations she uses in her own work. We will discuss color relationships and how a color can look different depending on what it’s next to. This class is suitable for the total beginner student who wants to learn more or for the advanced student who wants to expand their knowledge of color mixing to improve their paintings. All supplies are included in this workshop and you will leave with “cheat sheets” to use as a reference for future classes. This adult class is also open to teens ages 16 and up. The sky is the heart of a landscape painting. 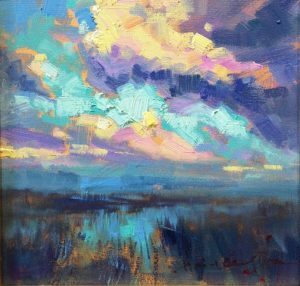 In this studio workshop we will dive into studying and painting the sky with oils. We will discuss how the sky is changing at different times of day, and what consistent principles can be found. We will also talk about the different varieties of clouds and how they optically interact with the sky. Also atmospheric glazing and other types of glazing will be demonstrated. A combination of imagination and reference material from master paintings will be used, no photography. Some painting experience necessary. 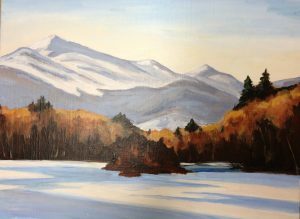 In this 3 week painting workshop, beginner students will learn how to paint a Winter scene in either oils or acrylics. Photos will be provided as a reference or students can bring their own. 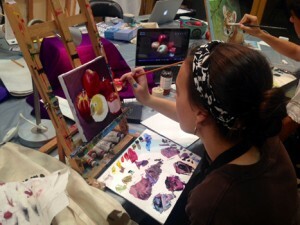 The instructor will lead the class with demonstrations, from initial sketch to finished painting. Instruction will be given in composition, sketching, value, color mixing, brushwork and use of materials. Students will gain an understanding of how to depth and light in their painting. This class is suitable for the beginner student who wants to further their skills. A supply list will be emailed to registered students. Oils or acrylics are suitable for the class but the instructor will be demonstrating in oils. (Jackson Art can provide you with use of art materials including for a fee of $65 for the three nights: includes use of oil paints, brushes, palette, rags, gamasol, canvas, & drawing supplies) Class size is limited to 8 to allow for lots of individual attention. Award winning , Hai-ou Hou has adopted a powerful abstract aesthetic of impressionist painting style for creating intensely colored, highly textured and provocative art. In this class, she will focus on the key elements of quick painting, and shares tricks and secrets for finishing a painting in less than two hours, making your painting more expressive and appealing, your colors bright and intense without being raw, and subtle without being muddy. 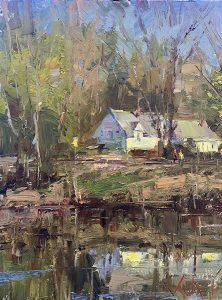 This workshop will prepare you mentally and physically for painting quickly in any subject or plein air. This class will take place in the studio and is open to all levels and any mediums.Supply list will be sent to registered students. 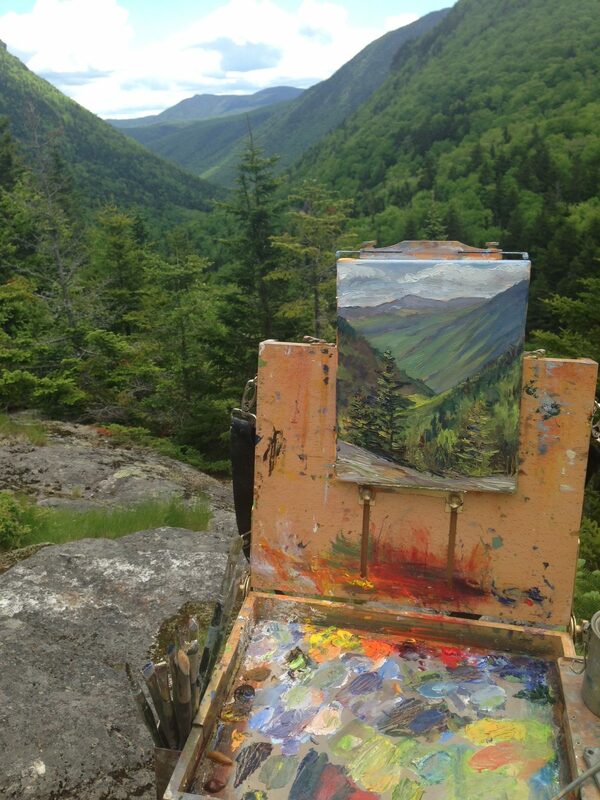 In these one day outdoor painting workshops, students will enjoy the process of setting up an easel outdoors and painting the beautiful Fall White Mtn. landscape “en plein air.” Through demonstration and individual attention in oils, students will learn how to distill the important information from their observation and translate it onto the canvas. 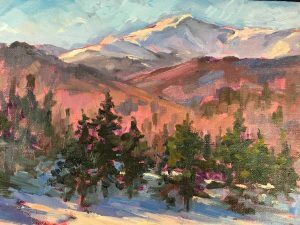 Melanie will address the importance of sketching, how to create depth in a painting, composition, color mixing formulas, light effects, and other tips for painting outdoors. 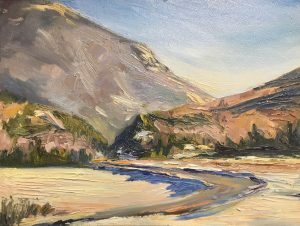 All this will be taught in an understandable step by step process which will lead students to improve their ability to see the landscape and create a finished painting in a short time. 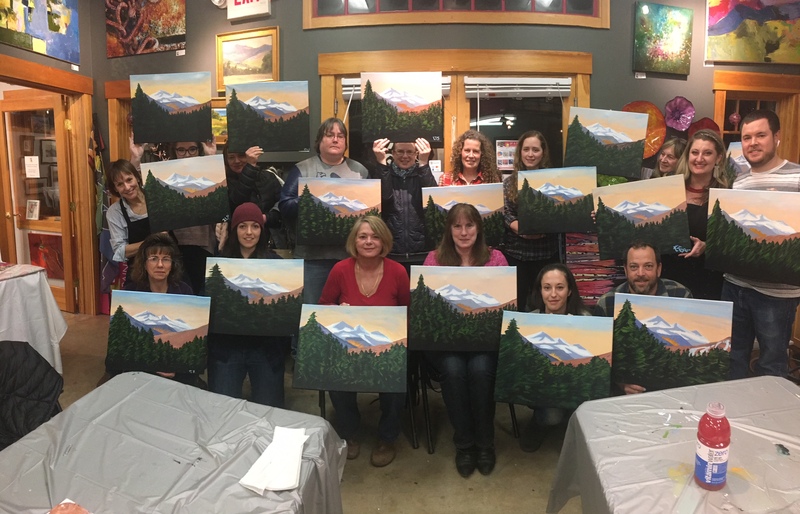 This class is suitable for the total beginner or the intermediate student who wants to learn how to paint outdoors. Students will complete a small painting. No need to invest in expensive equipment! We will provided all the supplies you need to paint for the day. (ie-use of plein air easel, paints, brushes, canvas, palette, turpentine, etc. (if weather is not suitable for outdoor painting, we will paint from photographs in the studio) This class is limited to 6 students to allow for lots of individual attention. We will meet at Jackson Art Studio and then travel to location. No need to invest in expensive equipment! We will provided all the supplies you need to paint for the day. (ie-use of plein air easel, paints, brushes, canvas, palette, turpentine, etc. (if weather is not suitable for outdoor painting, we will paint from photographs in the studio) This class is limited to 6 students to allow for lots of individual attention. We will meet at the studio and then travel to location. All students will need to bring a small sketchbook & drawing pencil along with a lunch, drink, sunhat, sturdy shoes and clothing layers to be outdoors. Locations TBD. Private & semi-private sessions are also available, please inquire. In this four week after school class, students will work on a series of drawing and painting projects with a Fall theme. This class will help students improve their skills in a relaxing and nurturing environment. Students will work at their own level and class size will be limited to allow for individual attention. Lessons include color mixing, shading, line, form and proportion. Work will be done in pencil and acrylics on canvas. All supplies included. Students should pack a snack and drink. $95 includes painting supplies Ages 7-13 yrs. PAST…SUMMER KIDS 2016 ART CAMPS & CLASSES! 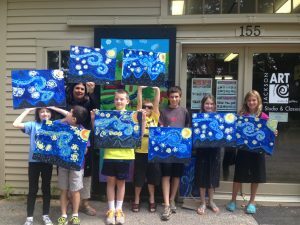 Inquire about 2017 Summer Art Camps.. Experiment with color, technique, and develop a series…. In this class you will deepen your understanding of the acrylic medium as you learn innovative mark-making techniques and explore color theory to create a series of abstract works. The focus of this class will be on how to start a painting, choose interesting color combinations, and achieve desired overall effect. We will view work of other contemporary artists, discuss negative and positive space and experiment with collage. Relaxation techniques will help you with your experimentation and get to the next level. This camp is for the kid who loves art and wants to create for 5 days! Students will work on numerous projects each day and be exposed to a variety of materials and techniques. Space is limited and only high quality art materials are used. Some projects include: Pet/Animal Acrylic Paintings, Zentangle Doodle Art, Clay Fish, Mosaic Creations, Miro Inspired Watercolors, Japanese Sumi-e /Origami, Squirt Gun Art, Mixed Media Metallic Art, Outdoor Nature Drawing, Games. Art History & More! Please pack snack, lunch & white t-shirt. SPACE LIMITED TO ALLOW FOR PERSONAL ATTENTION! Students will be exposed to many art mediums and projects and will leave with more artwork in one week than they do an entire year at school! This camp is for the kid who loves art and wants to create for four days! Students will work on numerous projects each day and be exposed to a variety of materials and techniques. Space is limited and only high quality art materials are used. 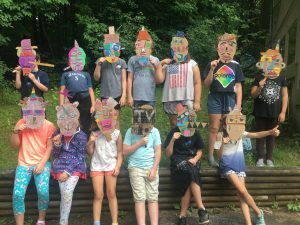 Some projects include: Pop Art Paintings, Paper Mache Creatures, Clay Owls, Mosaics, O’Keefe Inspired Watercolors, Logo Design, Jackson Pollock Art, Foliage Prints, Outdoor Nature Drawing, Games. Art History & More! Please pack snack, lunch & white t-shirt. SPACE LIMITED TO ALLOW FOR PERSONAL ATTENTION! Students will be exposed to many art mediums and projects and will leave with more artwork in one week than they do an entire year at school! 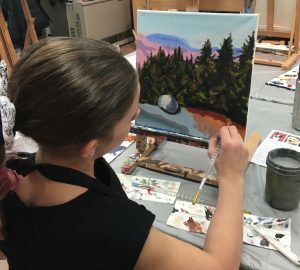 In this intensive class, students will each work on their own individual painting project in either oil or acrylics.They will choose from landscape or still life. (students can bring a landscape photo or use one provided) Lessons will be given in sketching, creating a successful composition, color & value. Class size limited to allow for lots of individual attention. This class is open to all levels & abilities. Students are responsible for the bulk of their own supplies. Supply list will be sent to registered students. 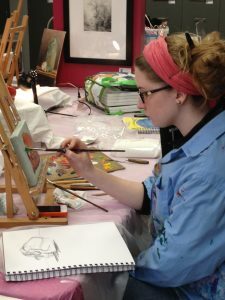 For a $45 fee, Jackson Art can provide oil painting supplies for the class. Create your own mosaic design on a wooden plaque using broken tiles, glass beads and other small bits. Create a dragonfly, butterfly, ladybug or any design you want! Older kids will learn how to use tile cutters to piece together their design. Younger students will use pre-broken pieces. Optional: bring some of your own small bits to personalize your plaque.